**Dietary products are not intended to treat, prevent or cure disease. Please consult with a Doctor or health care professional before starting the supplements. 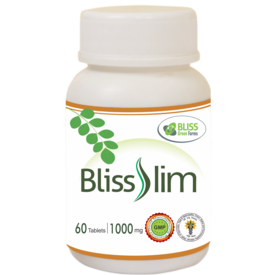 Benefits: Reduces Obesity Reduces absorption of carbohydrates & fats Regulates BMI Promotes in reduction of LDL-c and TG Dosage: 1 or 2 Tablets depending on BMI- before 30minutes of food intake twice a day *For best results, please use the product for 6 months Each 1000mg film coated tablet contains -Vrikshamla (Garcinia Indica) Fruit 500mg -Maricha (Piper nigrum Linn) Fruit 50mg -Sigru (Moringa Oleifera) Leaf 250mg -Coffee (Coffea arabica) Seed 100mg -Chaha (Tea) (Camellia Sinensis) Leaf 50 mg Count: 60 tablets Safety/Precautionary instructions: Do not use if pregnant or nursing without consulting a physician Store instructions: Store in a cool and dry place **Dietary products are not intended to treat, prevent or cure disease. Please consult with a Doctor or health care professional before starting the supplements.